Swashbucklers! : I've painted a figure! It has taken me an inordinant amount of time to do my second post but here it is. For no reason I can fathom I decided to finish this Mike Owen sculpted Foundry swashbuckler which I started years ago. In Elizabethan times halberds tended to be reserved for fighting on land rather than at sea. This is probably because with one swing of this you could cut down all the rigging of your own ship by accident! I bought all of these I could find as pre-releases and have painted eighteen in all. I have several more and am tempted to pitch them against some Darkest Africa figures initially, in a game. 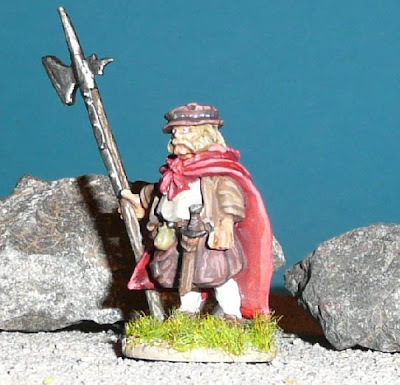 Some of the heaviest 28mm historicals you will ever find, these!